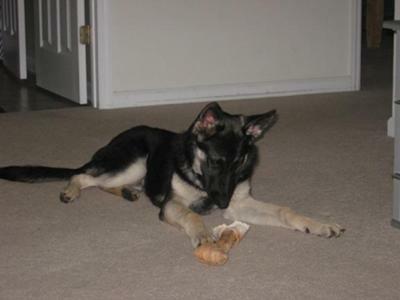 How long will my German Shepherd be submissive to other dogs? I have a 7 month male GSD. He is very well behaved and about average sized for his age. I've noticed that while he's around other dogs he is curious but very submissive. Is this part of his temperament or will he eventually grow to be more dominant? I don't want him to be overly aggressive but I'm hoping he will stand his ground. Give your boy time - he's still very young and at his age you expect them to be a bit submissive - he's still "learning the ropes" in Dog University. In fact, it's better that he's not too "cheeky" with adult dogs because that could definitely get him in over his head fast - especially if he were to come up against another confident adult dog. Keep introducing him to other dogs of all sizes, ages and temperaments as well as to all other animals you can you can - also things like other people, new places, different environments, car rides, dog friendly stores and buildings - whatever you can think of (as long as it's safe) because all of this will make him a more confident and stable German Shepherd and that is exactly what you want. This process is called socialization. If you keep doing all that along with proper training I imagine your boy will be just fine. Good luck with your German Shepherd puppy - he is beautiful. And keep the pictures coming in as you can.